Briefly defined, alternative metrics, or altmetrics are indicators of impact and engagement that extend far beyond traditional methods of influence measurement. Whereas to date academics and those involved in scholarly communication have looked primarily to impact factors and citation counts to assess the success of a piece of research, altmetrics provide a much more granular level of insight – both at the research output level and, crucially, beyond the academic sphere. At Altmetric, we track a defined list of sources (including public policy documents, mainstream and social media sites, post-publication peer review forums, and online reference managers) for shares and mentions of research outputs (that’s published articles, datasets, images, and things like white papers and grey literature). We disambiguate between different versions of the same output (the publisher and the institutional repository version, for example), collate all of the attention data together, and surface both a count of mentions per source and the underlying qualitative data (the actual text of the original mentions) via the Altmetric donut visualization and Altmetric details page. Collated altmetrics mean you can identify how your work is being received immediately after publication, and respond to the conversation. By viewing online media attention, researchers can easily see attention from people and places they may not have been aware of previously. This real-time data is particularly useful for early career researchers with a smaller body of work and a lower citation count, or those who are seeking to report back on their impact for a deadline soon after publication. It also presents an opportunity: whereas in the course of traditional citation and referencing methods the original author has little or no say in what context their work is represented, altmetrics offers stakeholders a chance to see who is saying what about a piece of research, and to respond accordingly. Tools like the free Altmetric bookmarklet can save you a massive amount of time, enabling you to view all of the data simultaneously, rather than checking multiple platforms and trying to accumulate the relevant online attention piece by piece. When combined with citation data, this information can help researchers to understand social impact and engagement as well as academic recognition. By understanding, analysing and interpreting their altmetrics data, researchers can add interesting evidence of broader impact to funding applications and reports. We’ve already seen a lot of activity that speaks to this need on the part of research funding bodies, who are attempting to position themselves as thought leaders in terms of narrowing the gap between research and the public. According to the Research Excellence Framework, grant funders are looking for proof of “broader impacts”, while The Royal Netherlands Academy of Arts and Sciences defines the “primary aim” of their SEP assessments as “to reveal and confirm the quality and relevance of the research to society”. In a short film on the Wellcome Trust’s funding website, Professor Jeremy Farrar said “researchers don’t exist in a bubble outside of society….to cocoon ourselves is no longer viable”. This would suggest that if researchers can demonstrate that they have adopted the relevant practices to demonstrate the public visibility of their work, their applications and reports are likely to be stronger. We’ve seen examples of this being done numerous times – you might like to take a look at this recent blog post, in which researcher Fernando Maestre details how he has used Altmetric data in his funding proposals. Having to show “evidence of research engagement” to their institutions can seem less of a chore if they can start hosting the data in one easy step. Click here for instructions on how to embed the free version of our donut badges on your own page. Using altmetrics, researchers can find new and interesting content, identify and follow new research trends, and contribute to the conversation around the work of others as well as their own. Being able to see who has Tweeted or blogged about your work allows you to engage with a community of researchers outside the walls of your own institution. This means you can start communicating with an online network of academics with similar research interests, which could potentially lead to new collaborative research partnerships. By identifying influential figures in their field through social media, researchers can adapt future outreach strategies for disseminating research accordingly. Altmetrics can also be useful for identifying which journals in your field have effective outreach strategies for promoting their research. Take a look at other articles in your field to see which ones are getting the most attention, where they were published, and what channels or outlets have been used to disseminate the content. 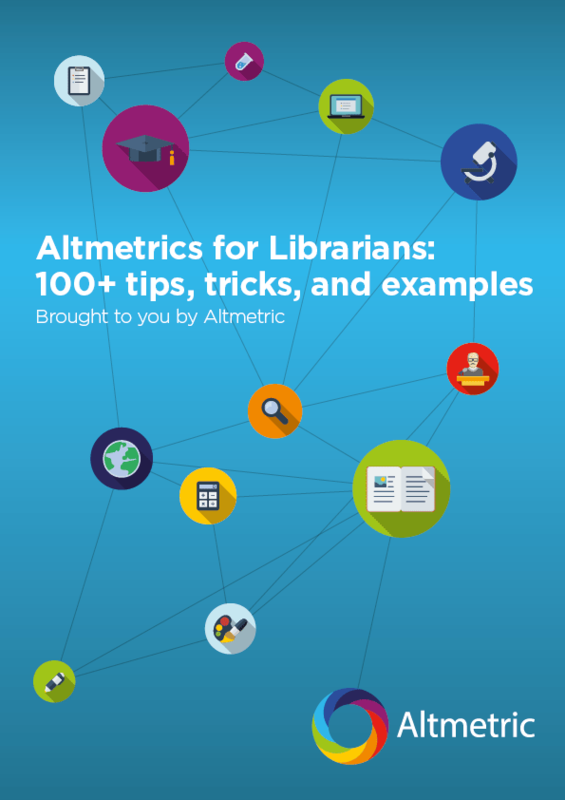 Equally, if you’re teaching, altmetrics data can be useful for identifying which articles are particularly noteworthy or might be good for your students to read as an example of engaging content. Next month, we will be analyzing some more specific examples of how academics have used Altmetric data on personal web pages to showcase their impact. We will also be publishing some Q&A responses from altmetrics-savvy researchers, to provide a first-hand perspective on the benefits of altmetrics data. We’d love to hear any ideas or experiences you might have on how researchers can get the most out of altmetrics – feel free to share any comments below or drop us a line to discuss further. Want to know more? Join our free webinar at 3pm ET/8pm GMT on February 18th to hear direct from researchers how they have been putting altmetrics to good use. Click here to register. "#Altmetrics in action: applications for researchers http://t.co/hXJId3aQAo" via @altmetric. @ProQuesAsker Hi Amber - these might be useful: http://t.co/6j28PBTXJt, http://t.co/JDIG1EA4Bu. We'd love to talk more about this with you..